Chord Company C-Screen review | What Hi-Fi? There is no everlasting autonomy in hi-fi. Like empires, all who rise will surely someday fall. But the Chord Company’s clean sweep of our speaker cable and analogue interconnect Awards last year, two of which it has held since 2015, suggests the time for change is not quite nigh. 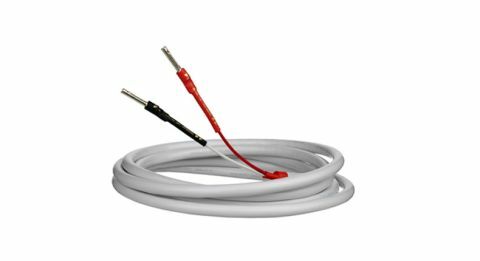 Certainly this C-Screen speaker cable, a more affordable alternative to its celebrated Clearway, isn’t the one to break the run of five-star reviews. Monetary savings, however, are not accompanied by a reduced level of technology or care on Chord Company’s part. Its specifications are similar to speaker cables further up the hierarchy. It has a thinner diameter than the Clearway – 7mm compared with 10.5mm – but otherwise looks much the same, finished with the white outer jacket that has become the company’s signature aesthetic. Beneath that, the C-Screen features what Chord Company describes as multi-stranded oxygen-free copper conductors, insulated with low-density polyethylene and arranged in a twisted-pair configuration to reduce interference. The white outer covers a PVC casing designed to reduce mechanical noise and space the conductors correctly. So what is all of that in today’s money? Essentially it translates to recognisable Chord Company performance, favouring your system's cohesion and musical performance over outright analysis. We run it through two separate systems: the first our reference set-up comprising Naim NDS/555 PS streamer, Gamut D3i/D200i amplification and ATC SCM 50s, the second and a more financially appropriate team of Cyrus CD i, Rega Elex-R amp and ATC SCM 11 speakers. Despite the chopping and changing of electronics and speakers, the C-Screen’s efforts with each were, pleasingly, the same. We play Manchester Orchestra’s aching A Black Mile to the Surface and the glowing warmth and solidity of each musical strand is luscious, full of body and packed with emotion. Buoyed by gushing harmonies, Andy Hull’s vocals are held tight to the rest of the arrangement - but given due prominence and all of the expression they deserve. The way each system times when linked by the C-Screen is also evident. Tracks such as The Gold, which is characterised by its drive, are held together as if with superglue, but without ever sounding mechanical. These strengths have had us bowing to Chord Company in recent years, in particular its focus on musicality over all else, but there is also a decent amount of detail to be wrung from its equally talented partners in this set-up. It's true some rivals sound cleaner, more spacious and offer more insight into textures - but none hold so tight a grip on the character of the music they’re playing. There are reasons you may not opt for the C-Screen. If you place more importance on space and detail, for example, QED’s XT25 will see you right in that regard. If your system already sounds warm enough, you may prefer a cable that won’t significantly add to that. Perhaps your budget stretches further, or your system deserves a little more - in that case the Clearway is an obvious step up for £10 per metre. But there is no denying this is another class-leading cable to add to Chord Company’s arsenal. What it does well, it does better than anything else we’ve heard at this price.